Chocolate Swiss Roll Cake is the ultimate decadent gourmet dessert that looks ridiculously complicated but is totally doable. It's SO amazingly scrumptious. Gluten-free. Taste: SO much brilliant chocolate flavor. Texture: This roll cake is somehow simultaneously rich yet light. It is unbelievably good and dangerously addicting. Don’t say I didn’t warn you! Ease: I won’t lie, this cake is complicated and will make a mess. But I’ve laid out every single step in the video so you can see exactly how it’s made. It’s totally doable, promise. Don’t be scared! Appearance: Absolutely stunning and perfect for the holiday season. Pros: Incredibly impressive and gourmet. It tastes as good as it looks! Would I make this again? Absolutely positively. I want to eat this cake everyday. This cake makes me so happy and I am ridiculously excited to share it with you today. It’s as mouthwateringly delicious as it is beautiful and you will absolutely have a hard time not eating the entire thing yourself, it’s that good. 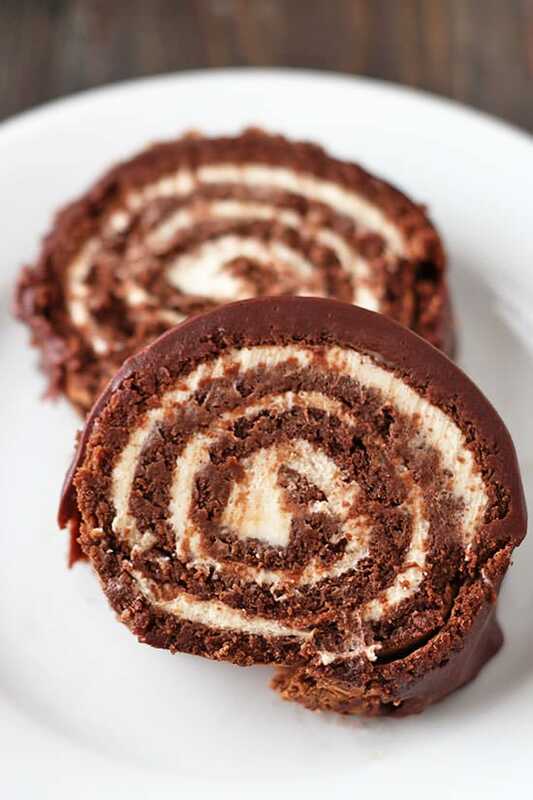 Not to mention this Chocolate Swiss Roll Cake is absolutely perfect for the holidays with it’s festive swirly wonderfulness, though I’d certainly take a slice at any point in time. I won’t misguide you, this cake is a bit more complicated than other recipes and it will create a bit of a mess. But it is SO SO SO worth it. It could actually be a really fun weekend baking project during this holiday season. And the extra effort involved makes the first bite that much sweeter. Even though there are a few components involved and some tricks to making a beautiful Chocolate Swiss Roll Cake, I’ve got you completed covered with the video above. Just take a peek to see exactly how this cake is made with every step and tip along the way. 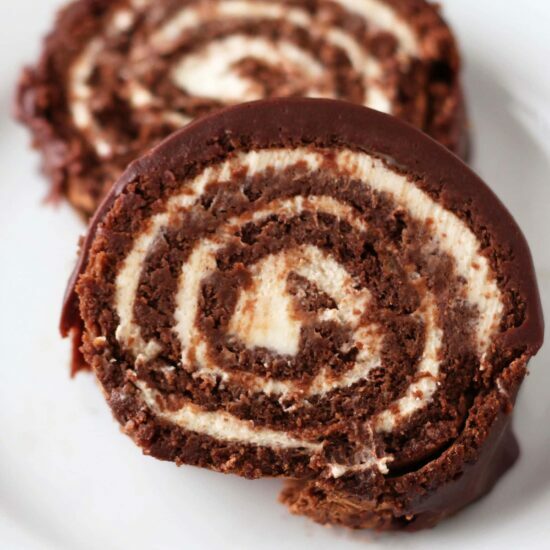 If you make this Chocolate Swiss Roll Cake, be sure to take a picture and tag it #handletheheat on Instagram. I love seeing your photos! Preheat the oven to 350°F. Butter or oil a 10-by-15-inch jellyroll pan or a 16-3/4 by 12-inch sheet pan. Line the bottom lengthwise with a piece of waxed or parchment paper. Combine the chocolate and coffee in a heat-safe bowl and microwave for 45 seconds. Stir, and continue to heat in 20-second bursts, until the chocolate is almost melted. Continue to stir until melted completely. Let cool. In the bowl of an electric mixer fitted with the paddle attachment, beat the egg yolks until pale and creamy. Gradually add the sugar and continue to beat until yolks are pale and ribbony. Gently stir the cooled chocolate into the yolk mixture. In a clean bowl of an electric mixer fitted with the whisk attachment, beat egg whites with salt until they hold stiff peaks. Stir a quarter of egg white mixture into the chocolate-yolk mixture to lighten it. Gently fold the remaining whites into the cake batter in three additions. Pour the batter into the prepared pan and smooth top. Bake in preheated oven for 15 minutes for a jelly roll pan and 12 minutes for a half sheet pan, or until cake layer feels dry (but very soft) to the touch and a toothpick inserted into the center comes out clean. It will still seem a little underbaked. Transfer to a cooling rack and cover the top with a lightly damp towel for 10 minutes.Remove towels and run a knife around the edges of the cake. 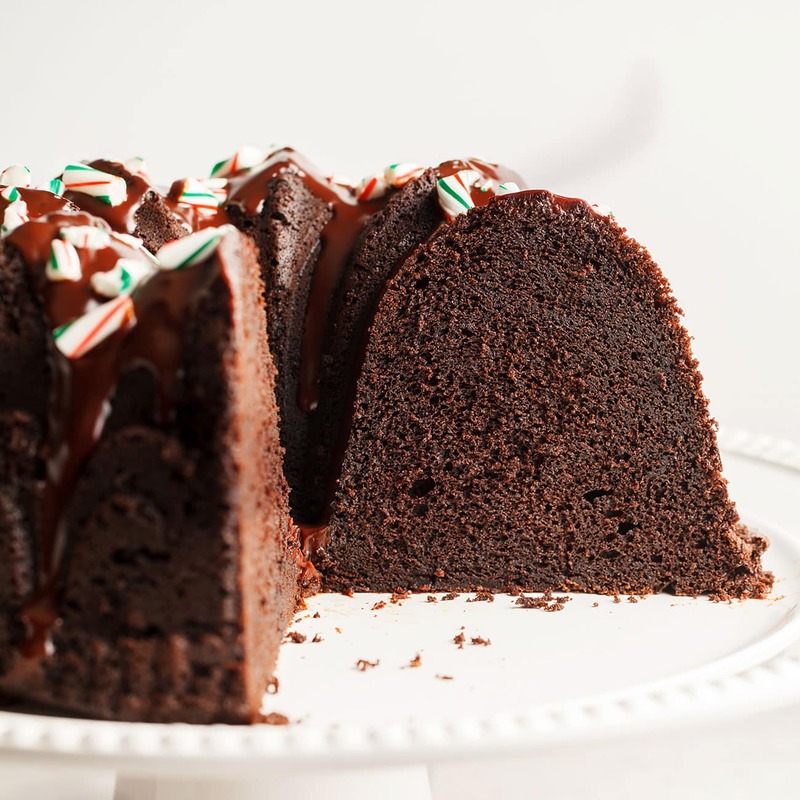 Sift one tablespoon of cocoa over the top of the cake and cover the cake with a thin tea or flour sack towel that is a little longer than the pan. Place the back of a baking sheet or a large flat tray over the towel and invert the cake onto it. Gently peel back the parchment paper. Sift the remaining tablespoon of cocoa powder over the top of the cake. Roll the cake up with the towel from short end to short end so the towel is inside. Let cool completely, seam side down. Once cool, beat heavy cream with powdered sugar and vanilla until it holds stiff peaks. Get your serving plate ready and place it near your cake roll. Gently unroll the chocolate cake. Spread the whipped cream filling evenly over cake, leaving a 1-inch border at the far edge. Gently use the tea towel once again to reroll cake and place on the serving plate. Wrap the log tightly in plastic to keep its shape and store in the fridge while preparing the ganache. In glass measuring cup, microwave the chocolate and cream for 45 seconds. Stir and continue to heat in 20-second bursts until melted and smooth. Chill until thickened, about 10 minutes. Remove the plastic from the cake and trim both end pieces. Spoon the ganache over the cake and smooth over the sides. Chill for 1 hour, or until set, before slicing and serving. The cake can be stored in an airtight container in the fridge for up to 2 days, though the filling will deflate the longer it’s stored. So Yummy. Thanks everybody loved it. No flour? i’m confused on what is holding this cake together. It looks fantastic. Huh? Is this Swiss roll without any flour? Is that possible guess the cake will break up while rolling? 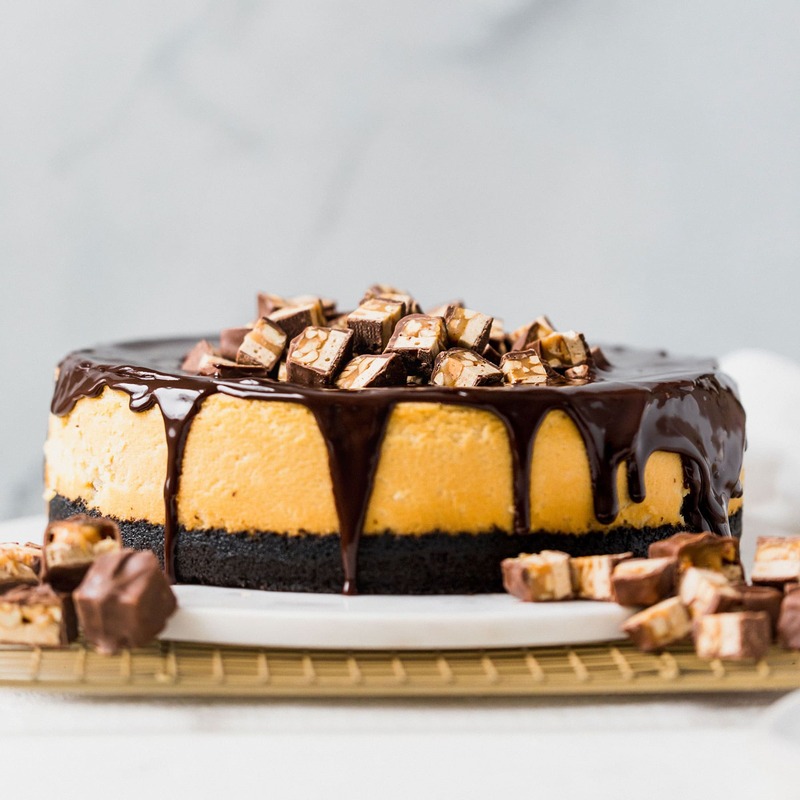 I have a little question, I’m from Germany and I love to make cakes and such things but I hadn’t got the time till now to do any of your recepies (because I can only do it when I’m at home by my parents – my kitchen hasn’t got an oven :/ ). So now my question is what kind of oven or, to discribe it in another way, what kind of heat do you use. In Germany we can choose between different settings for our oven. The two main settings are 1. top and bottom heat and 2. (somithing like) fan oven (don’t know if I translated it the right way). Which of these two setting would you say do you use? I would be realy happy about a reply. (And please don’t be put off if I don’t use the right grammar or spelling or phrase). I think I know the answer to your question. In the US, we have out regular conventional ovens, and our convection ovens. How is that for confusing?? CONVENTIONAL ovens are probably comparable to what you are calling TOP AND BOTTOM heat ovens. Our CONVECTION ovens use a fan to distribute the heat better. Though the convection oven (the one with the fan) is considered pretty great, most people don’t own them here (they’re about $1000 more). Because of that, most recipes here are developed with a conventional oven in mind (no fan). This looks awesome! I was hoping to make this a week ahead and freeze it. Do you think it would be okay if I freeze it for a week? This probably isn’t the best recipe to freeze because of all the cream involved. It would likely deflate and separate. I’m from India and i absolutely love your recipe especially the way you give a detailed description for everything. Last month i tried your ‘Best chocolate cupcake with swiss meringue buttercream’ and they turned out AMAZING! I tried making the chocolate swiss roll today but unfortunately it didn’t turn out fine 🙁 . When i flipped it on a tray to remove the parchment paper, it just wouldn’t come off without half the cake stuck to it. The only thing i did different was not use the paddle attachment to beat the egg yolks (as i don’t have it; used the whisk instead). Maybe that’s where i went wrong. Please help me figure out what went wrong. 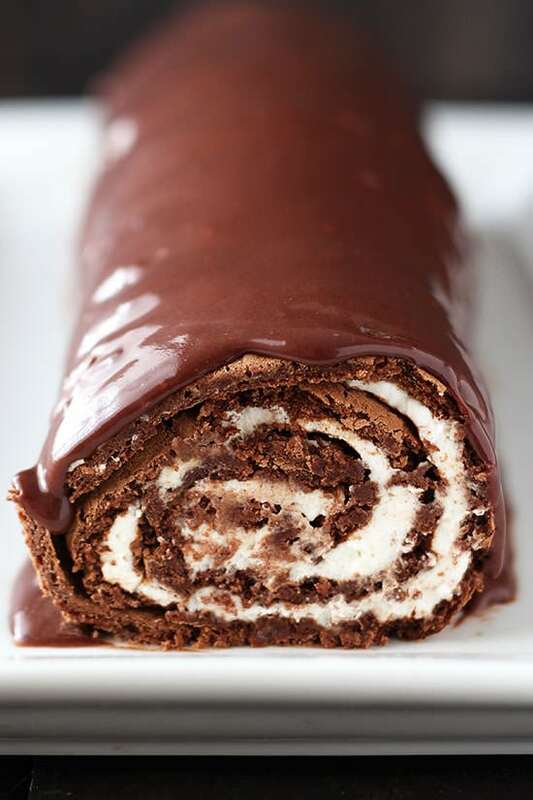 I really really want to make this chocolate swiss roll. Hi Shruti! I’m so sorry to hear that. It sounds like maybe the parchment paper you used didn’t have a nonstick coating on it? Have you had foods stick to it before after baking? Yes I’ve used the same parchment paper and it usually doesn’t stick. Anyways, I’m definitely not giving up on it. Will try baking it again (with extra caution) in a few days and hopefully it’ll turn out fine. Fingers crossed! Hi Shruti, I saw your coment and I thought I should tell you the following. Thank you so much for the suggestion. Will try this the next time I attempt making it. I made this cake this week, and it was spectacular! 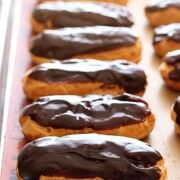 I especially love that it is gluten free without needing any flour substitutes. I’d like to try making it in other favors, but I assume you’d need some kind of fat to use in place of the chocolate. Maybe coconut oil? Has anyone one else tried something like that? 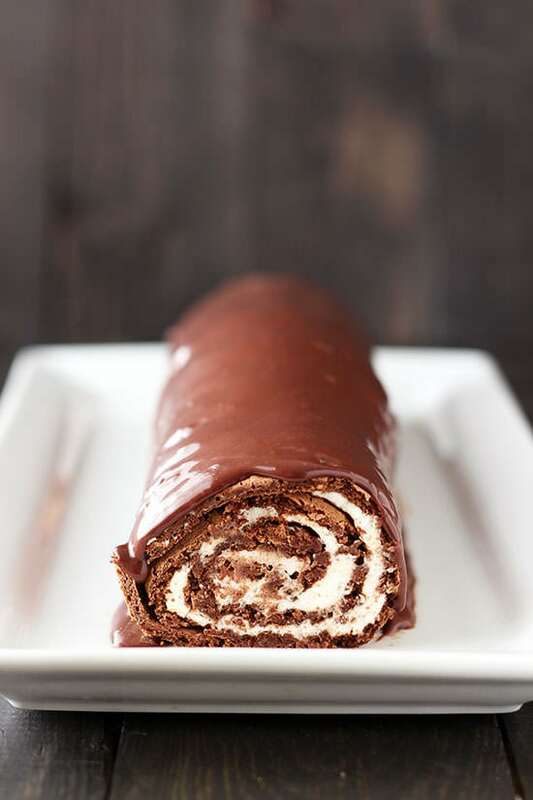 Chocolate Swiss roll eggless recipe please..
What Cake Roll Pan do you recommend? I have used my cookie sheet and the cake is very, very thin, the edges even burn. The pan will even bend because of the heat. So the batter is not distributed evenly. Actually this cake freezes well, just wrap tightly and freeze before adding the ganache.